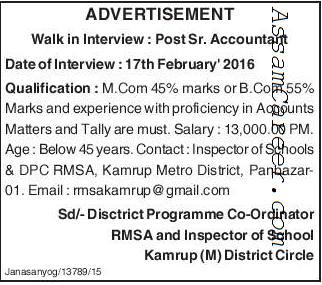 O/o Inspector of Schools & DPC RMSA, Kamrup Metro. A walk in interview will be held on 17.02.2016 for engagement of Sr. Accountant to Inspector of Schools & DPC RMSA, Kamrup Metro. Educational Qualification: MCom 45% marks or BCom 55% marks and experience with proficiency in Account matters and tally are must.